Hi again everyone! 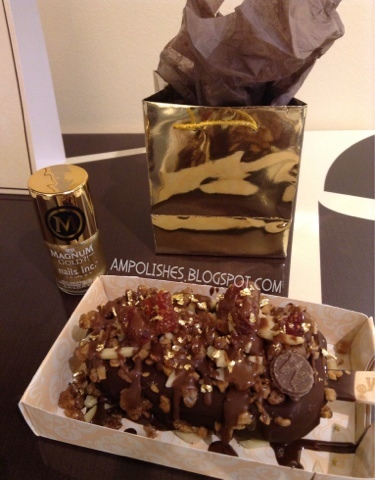 I had been meaning to share my experience of the Magnum popup store here in Toronto. A couple weeks ago I found out that the ice cream brand Magnum had opened up a popup store in downtown. I was immediately curious because I had never been to a pop up store and because I heard rumors that a Nails Inc polish was given out if you knew the code word. For $6 the store offered a bar of ice cream (you had the choice of chocolate or vanilla bean) dipped in your choice of milk, white or dark chocolate and an unlimited amount of toppings. These toppings included common stuff like chopped almonds, coconut shreds, toffee bits etc and more interesting things like goji berries, bacon bits, rose petals for the more adventurous. Click to find out what the code word is! 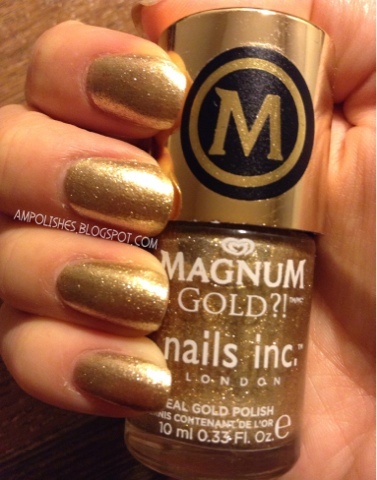 When I got to the cashier I had to say the code "golden touch" and I received gold flakes sprinkled onto my ice cream bar and a bottle of Nails Inc #Golden Touch! 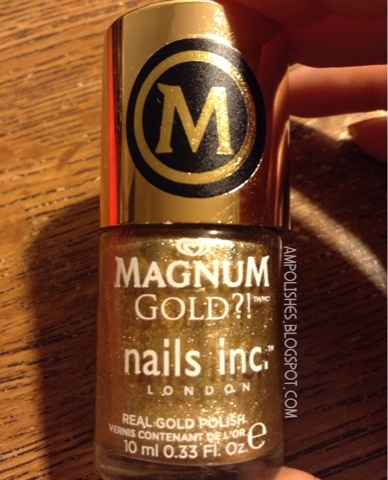 I was super excited when I first saw the polish, on the label is said "real gold polish" do I thought could it possibly be a gold flakie topcoat!! But when I looked closer it turns out it was just a regular gold polish. Maybe they had meant real gold colored polish. Sure I was a little disappointed because I expected more and the media sure hyped things up. 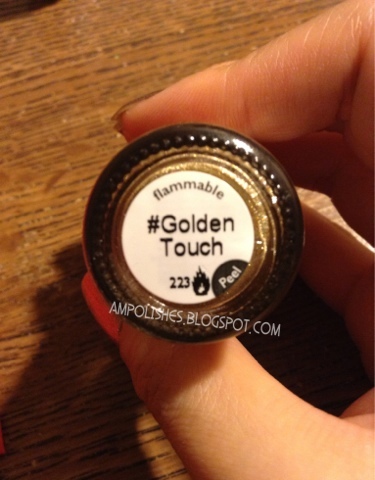 I mean the polish is called #Golden Touch...hash tag included in the name. I was pretty pleased with the formula though. Two coats was all I needed to achieve opacity. Overall it was a fun experience, I got a delicious ice cream bar and a free polish out of it so I can't complain. 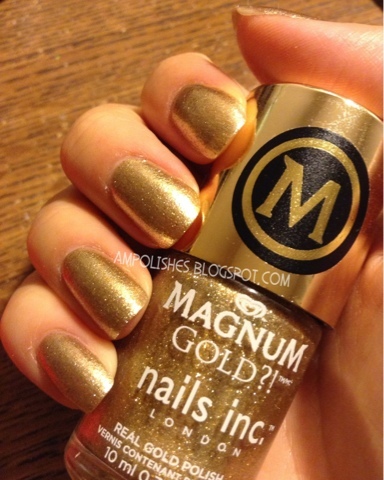 Although I wish it could've been a gold flakie topcoat because the label was misleading. 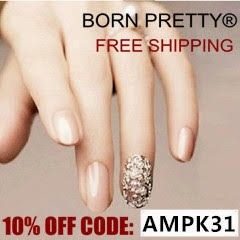 haha nice, free polishes should come with EVERYTHING!! !